It has been such a long time since my last outfit post ( it was 11 days ago! ), therefore, yesterday I persuaded my amazing mom ( who always lends a helping hand when I need a photographer) in taking my outfit pictures before going to my cousins place and celebrating her 18th birthday ( big hugs and kisses to my awesome cousin Anita! :*). As it was a birthday party I decided to wear a fancy outfit and curl my hair, which, by the way, I do very rarely as I am trying to keep my hair as healthy as possible! But I must admit, I do love wearing my hair in nice beachy waves or curls- they make me feel a bit more feminine and it is a nice change from my usual straight hair! Tā kā mēs devāmies uz dzimšanas dienas ballīti, es nolēmu uzvilkt nedaudz svinīgāku tērpu un salokot matus. Parasti es cenšos izvairīties no matu cirtošanas, jo es cenšos saglabāt matus pēc iespējas veselīgākus, bet man patīk, kā tie izskatās- es jūtos nedaudz sievišķīgāka un šī frizūra ir jauka pārmaiņa, jo parasti savus matus nēsāju taisnus. Cute. dear!! 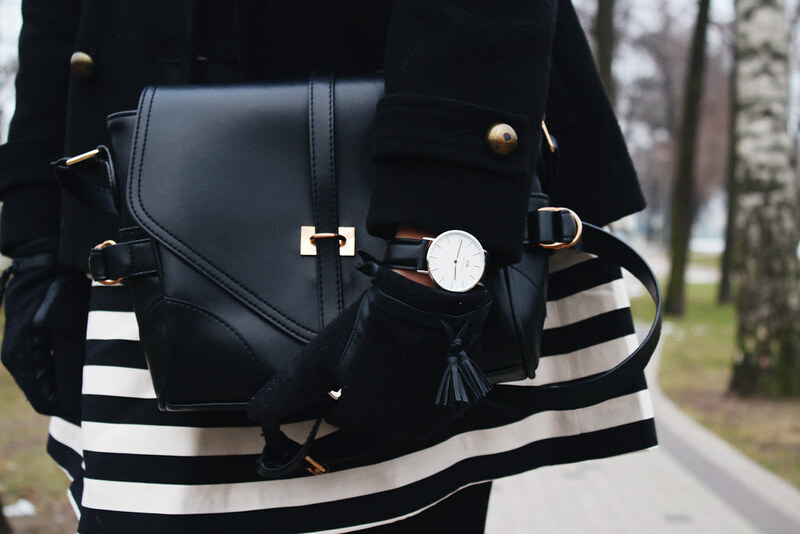 I love so much this black and white look! Great outfit and beautiful necklace! You look great. Love your beautiful hair! I don't know what to say Maddie! You look stunning as ever!!! your whole outfit! gosh I'm so in love with it!!!! ahhhh….Your curls made it more beautiful! I wanna have them too, need hard work 'cause I'm very bad at curling hair hehehehe I want a watch from Daniel Wellington too but I'm afraid they are expensive. Such a ladylike outfit, I love it for the season! 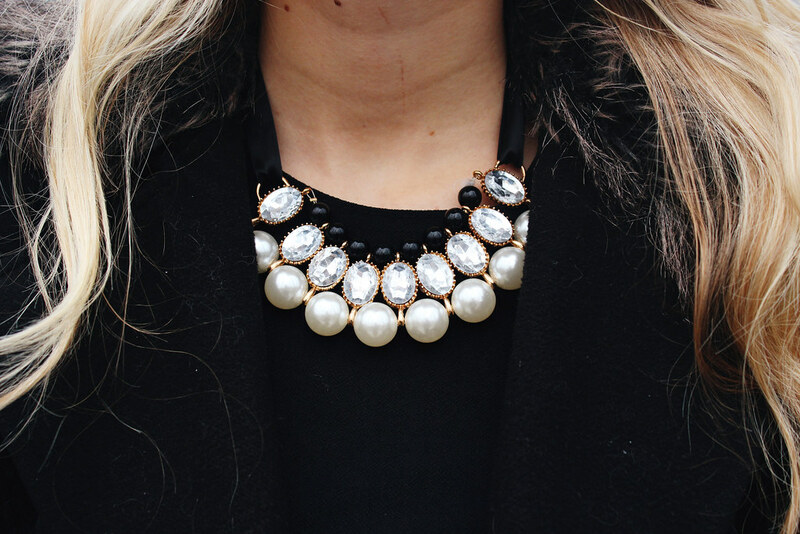 Perfect necklace and you truly look so polished and classy. You definitely know how to rock black with style! I am in love with your gorgeous monochrome skirt 😀 Also your hair is looking fab. Happy Holidays, take care. Oh my, you look fabulous!! I love your hair like that and your skirt is gorgeous! You look so lovely! What a classic and pretty outfit! P.S. — I read your latest post and I'm so sorry about your grandmother. Love the skirt on you and the necklaces are SO pretty! Your hair looks beautifil is the soft curls,it frames your face so perfectly ! I want those boots Maddie!!!! I am sorry for being absent all the time. Please forgive me. How you doing? Your hair looks absolutely stunning. You should do it like this more often. I love your skirt and the stand out necklace. Love your hair! I'm the same way, I rarely do curls but they always end up looking so good. Sie svarki jau maniti ari cita bloga un ka nu, tadiem pateikt ne vaikala. Tik briniskigi, tik parisian chic. Loti patik stripas, klasika. Ar matiem es ar biezi nedaru neko, jo te ir mitrs gaiss un man ir gari, smagi mati, si kombinaci nemaz nepalidz, lai matu lokas turetos. Esmu izmeginajusi daudzus produktus. Reizem sanak un reizem kamer iziet ara, lokas pazudusas ka nebijusas, tadel daudz necensos lokot. Laumas zekubikses ir jaunums. Neatceros vai agrak Lauma ari razoja vai tas ir kas jauns? Izskaties romantiski un briniskigi. Jubilarei, daudz laimes!